Hobson & Co is your premier livestock partner. Contact us today to arrange a consultation. 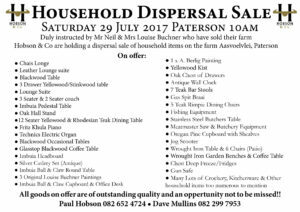 The Preston Park sale was yet again a success. 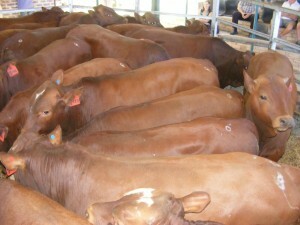 Prices were good, with weaners averaging R15.01 with the top price being R15.47 sold by Beilen Trust. 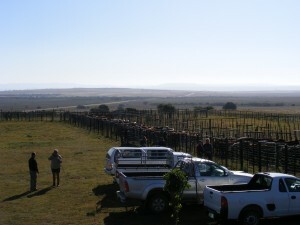 Also Daan van Rensburg sold a beautiful group of 16 calves weighing 354kg and selling for R5300 each. Congratulations to Andrew Deacon, pictured center, winner of the Charlgrove Weaner Competition for 2013. This cow & calf achieved the top price of R 56 000 at the Great Karoo Tuli Dispersal Auction on 24 April, 2013. We urge all breeders to adhere to the rules and guidelines surrounding the branding of beasts. Feedlots and auctioneers will reject incorrectly branded animals. Subscribe to the Hobson & Co mailing list to receive notifications about upcoming auctions & events, recent reports, articles, news in general and much more! * This forecast was obtained from Yahoo! Weather. Unfortunately we cannot guarantee accuracy.